Today, Azer saw ENT a few months sooner that an already scheduled appointment, mainly because he cannot use a nose clip during his nebulizer treatments anymore. He says it feels like the nose clip is squishing something in his nose, and it hurts. He also has had no sense of smell for the past few months, and allergy season isn't making it any better. The ENT doctor looked with the scope today, and saw a few polyps, and some inflammation, but nothing bad enough to schedule surgery yet. She wants Azer to try to put a full vial of an inhaled steroid medication in his nasal rinse, and to do it consistently four days a week. 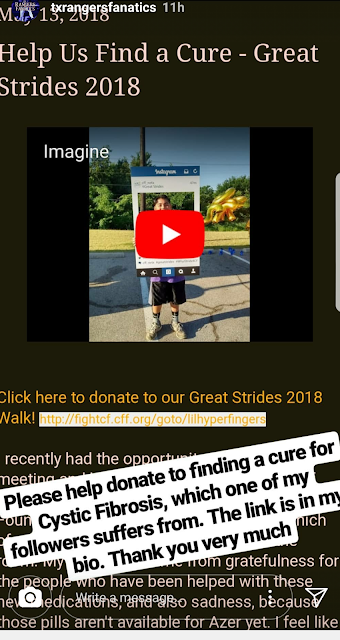 She wants him to try this for the next 6 weeks, and if it hasn't worked by then, to try another course of steroids, to try to shrink the polyps. Azer sent these screen shots to me the other day from Instagram. 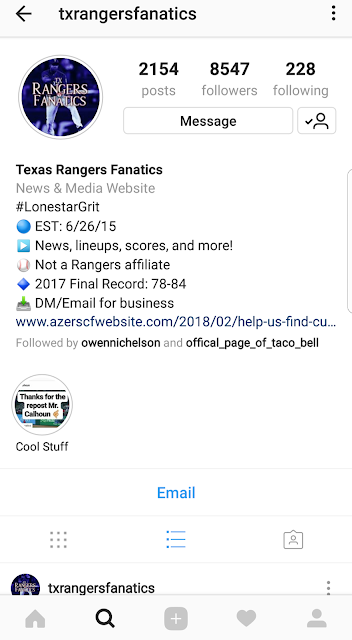 I thought it was so cool that this Rangers Fan's page shared Azer's website and is helping raise awareness for CF! Thank you #txrangersfanatics!